An enormous variety of species live in the thin layer on Earth's surface that makes up the biosphere. None of these species is found everywhere on Earth's surface. Instead, the number and kinds of species change dramatically as one moves from one place to the next. The science that studies the past and present distribution patterns of organisms and seeks to understand the mechanisms that underlie these patterns is called biogeography. Environmental variability: For a variety of reasons, the conditions that organisms experience change dramatically across Earth's surface. Climate and elevation are two major influences. Ecological limitation: Every organism has a limited range of conditions that must be met in order to allow it to live and reproduce. Since a species is a population of reproductively compatible organisms that have similar biological properties, no species can be found everywhere. Continental drift: The locations of landmasses across Earth's surface have not remained the same, but have changed slowly over the course of Earth's history. Therefore, the conditions experienced by organisms change over long periods of Earth's history. Evolutionary change: Species do not stay the same over time, but are in a constant state of change as individuals best able to survive and reproduce within certain environments become more frequent, while others less capable die or fail to produce offspring. The ability of a species to evolve allows it to persist over long periods of time and track the changes occurring on Earth's surface. The first two principles indicate that the current geographic distribution of a species is determined by how its ecological limitations are related to the environmental conditions it encounters. Species with similar requirements will be found together in the same locations. Regions on continents or in oceans where the species share similar ecological limitations are called biomes. For example, deserts are biomes where the species are all able to withstand relatively hot, dry climates. 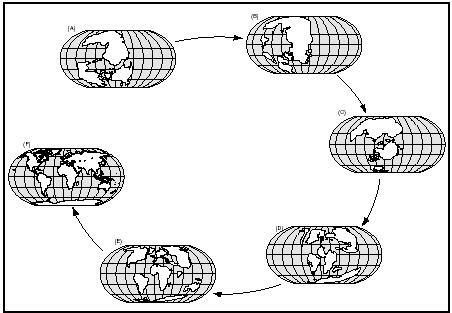 The third and fourth principles indicate that as continents move about across the face of Earth, they carry with them the species that inhabit them. When continents that were once connected separate, populations are fragmented, and subsequent evolutionary changes in related species will occur independently. The timing of such independent evolutionary changes provides clues about the timing of Earth's history. Much of the history of continental drift, for example, can be reconstructed by examining the geographical distribution of fossils and of related groups of living species. The distribution of landmasses at points in Earth's history, illustrating the theory of continental drift and the changing conditions organisms experienced due to it: (A) 320 million years ago; (B) 250 million years ago; (C) 135 million years ago; (D) 100 million years ago; (E) 45 million years ago; (F) present. species may undergo evolutionary change to adapt to changing conditions. Third, if a species cannot shift its geographic range or undergo evolutionary change, the species will go extinct. Over the history of Earth, no species has been able to persist unchanged as the biosphere has changed. Brown, J. H., and M. V. Lomolino. Biogeography. Sunderland, MA: Sinauer Associates, Inc., 1998. Cox, B. C., and P. D. Moore. Biogeography: An Ecological and Evolutionary Approach. Boston: Blackwell Scientific Publications, 1985.